Mongrace Montessori House was established in 1964 by the late Ms. Monjushree Chatterjee and the late Mrs. Grace Wasim Pina. The name ‘Mongrace’ has been coined by combining the first names of the two Founders. Mrs. Pina did her training under AMI in 1962-63. She started Montessori classes at her house in Middleton Row. Her vision was to guide children in their formative years. The classes shifted to 1, Short Street a year later. The school began by one environment and each year an environment was added. Some of the teachers who joined Mongrace in 60’s and 70’s were Anjana Saraswati, Aloka Dam, Gouri Dutt and Mridula Mukerjee. School grew in name and fame because of Mrs. Pina’s vision shared by Ms. Monjushree Chatterjee. 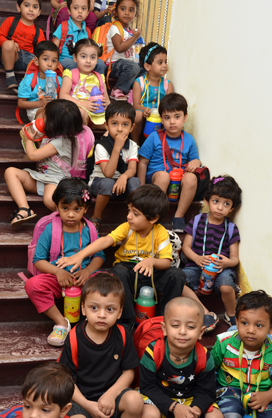 Some of the great Montessorians of Kolkata remember Ms. Pinna as greatly disciplined and a perfectionist. She was an excellent guide and knew each and every child very well. Dipali Sen, Aparna Mukherjee, Neelam, Sonali Basu, Abanti Chattopadhy and Kavita Lohia some of the teachers at Mongrace, Short Street trained by Ms. Grace Pinna are carrying forward her vision and mission. The Suresh Amiya Memorial Trust (SAMT), a public charitable Trust founded by the late Dr. Sadhan C. Dutt for the promotion of art, science, education and healthcare, took over the management of Mongrace Montessori House in 1984. Dr. Sadhan Dut was one of the brightest stars over the horizon of Engineering Consultancy. A great philanthropist; he set up schools and hospitals. He received numerous accolades and awards. His principle was to meet social objectives by seeking the highest standard of business ethics thus ensuring a harmonious work environment while working for the welfare of the community. Ms. Shanta Ghosh, Chairperson of the DC Group, is carrying forward the legacy of her father, Dr. S.C. Dutt. She has diversified the company’s business portfolio and is continuously steering it to new heights. Extremely progressive in her thoughts, Ms. Shanta Ghosh supports new ideas and innovations that help Mongrace schools to constantly evolve and achieve excellence. At Mongrace, children are offered ‘a prepared environment’, where the child can perform activities with interest, joy and self-achievement under the guidance of a trained Helper. The word ‘House’ in Mongrace Montessori House implies a home where children are not exposed to the dull atmosphere or regimentation of a school room but are allowed to progress in an environment reminiscent of their homes. It is matter of great pride that many of those who took their first step towards learning in Mongrace are today great achievers and successful in various fields. And it is a matter of further pride for all at Mongrace that the children of ex-students of this school are continuing the tradition of their parents to take their first step towards learning here! Dedication of teachers, their competency and willingness to innovate makes Mongrace what it is! In the C fore Survey of All India Pre School Ranking (2012-13) Mongrace ranked second and achieved excellence in six parameters some of which were competence of teachers, innovative teaching, leadership and provision for children with special needs. Montessori Teachers Training Course Classes started at Short Street from July 2013. This year Mongrace by registering with British Council has started its Global Journey, and has connected with schools all over the world. 2014-15 will be a year of celebrations as Mongrace completes its 50 glorious years!